Be Prepared! The Cold weather can play havok on a Car Battery. Book your car in for a Battery Check. To receive £5 off discount coupon from any D&G Autocare garage please supply your name and car registration. Your Discount battery coupon will be sent by email. Present to the cashier before paying. 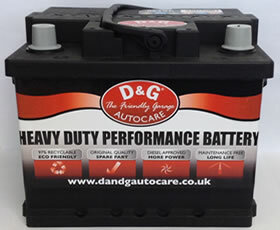 D&G Autocare stocks a great range of our branded batteries for different vehicles. We have taken our time to seek out a product that will match our trusted D&G Autocare brand.! If you would to seek professional and independent advice on the best battery for you. Just contact your local D&G Autocare Garage or Call 01383 623853.